This is an exclusive excerpt from my new book, Success by Design: The Essential Business Reference for Designers, which was recently released by HOW. As I read through his resume, the designer stared at me expectantly. He had a wealth of great design projects under his belt. He had been seeking out personal projects to build out his portfolio. He had internships with sterling businesses and design studios. But there was one thing that leapt out at me from the list of core skills he’d listed at the top of his resume: strategy. Not brand strategy, content strategy, interactive strategy, media strategy, or the MBA-land of business strategy. Just plain ‘ol strategy. This has been happening more and more frequently, for a few reasons. In the process of providing strong service to our clients, we increase the likelihood of becoming a strategic partner. We finally have a seat at the table when the client is talking strategy—and we can offer a range of strategic services that verge outside what may be considered a designer’s core area of expertise. This is a good thing. With the ongoing expansion of design’s role in business, today’s designers are helping to solve problems that transcend mere decoration and instead impact the core functions of a client’s business. But in our haste to be strategic partners, I’ve discovered that many designers don’t fully grasp how strategic services fit into their client offerings. And when I ask designers out of sheer curiosity how they’re functioning as strategists—what experiences they directly bring to bear on being strategists rather than having a strategic orientation—they can’t easily answer the question. If you’re going to run a design-led business, it’s inevitable that you will need to talk strategy with your clients. So let’s explore the types of strategies you might create as a design businessperson, as well as how they may support the efforts of your clients. It’s my hope that this information will open up some new paths for you to explore in your career as a designer. The dictionary says: a strategy is a “plan of action or policy designed to achieve a major or overall aim”. Intention leads to action, which hopefully yields a desired result. But don’t get too excited about the word “design” appearing in this definition of strategy. Even though plans or policies may have been designed, that doesn’t mean strategies are about designing or are created by designers. Unintended consequences also influence how designers create strategies. “Strategies… have to form as well as be formulated,” says Mintzberg, in reference to the ways companies react to continual fluctuations in the behavior of their competitors, customers and culture as a whole. For example, a soft drink manufacturer plans to release a new pink-colored soda that tastes like watermelon, but it will take at least a year for its product to reach the market. An article in ‘The Wall Street Journal’ says that their competitor is rolling out a line of fruit-flavored sodas, starting with a watermelon flavor in just one month. Both companies may have similar strategies for how they will roll out their products, but the late entrant to the market will have to reformulate its strategy in order to establish a successful position. A strategy has no value if it can’t be acted upon. In your work as a designer, you will be asked to take many positions with regard to what strategy means to your clients. You may perceive new patterns through your research and recommendations. For another client, you can suggest a specific position or change their perspective. You may also find yourself recommending particular tactics for your clients to assume a better position in the market. Just by fulfilling design activities you are often realizing strategies, whether you intend to or not. But this does not mean that you are practicing strategy. Compare the above definition of “strategy as a plan” with how Charles Eames defines design: “Design is a plan for arranging elements in such a way as best to accomplish a particular purpose.” If a designer’s actions are aligned with a particular purpose, then they may be strategic. This does not mean, however, that they are intending that strategy or able to fully describe the course to get there. This is the domain of a design strategist. How does a designer practice strategy? Design strategists will help any design team create the why and the how that will lead to a more meaningful what. Design firms are generally good at addressing what should be made, but their abilities may vary based on the how and the why. Many designers, in their design training, are not initially prepared to address what a client needs to understand around the why, and design firms can often leave a client hanging regarding the how. What does Abby mean by the what, the why, and the how? Why: We need to understand our client business problems and identify where they should explore solutions to those problems—which segments, which user needs, which markets and which opportunities? A designer practicing strategy must be able to explore and describe why certain conditions have led to the need to create new things in the world, or to change or remove existing things from the world. These conditions could be related to customer behavior, market competition, cultural trends or other factors. The design strategist must be able to discern patterns and identify competitive positions in order to establish a more holistic perspective for their clients. What: We have identified opportunities regarding what to design, supported by insight. These opportunities clearly indicate possible design solutions that will influence a client’s business for the better. As Abby noted, most design businesses spend the majority of their time intuiting what should be made, but they may not always know why what they are making will have a meaningful business impact. A strategist should be able to work with a design team to plan a future state for a business’s customers with the inclusion of new or improved products and services, as well as any new branding approaches, marketing or advertising positions. These plans should help clients focus attention on a specific position in relation to their competition. How: Based on agreed solutions, we determine how possible design solutions will be designed, implemented and brought to market. A design strategist would also assess how prepared the client organization is to realize those solutions and the potential impacts of doing so. A design strategist should help a company understand how to realize the solutions they’ve envisioned and designed at a high level. This could require anything from creating implementation road maps to designing, building and shipping products, services, new brand guidelines and advertising campaigns. 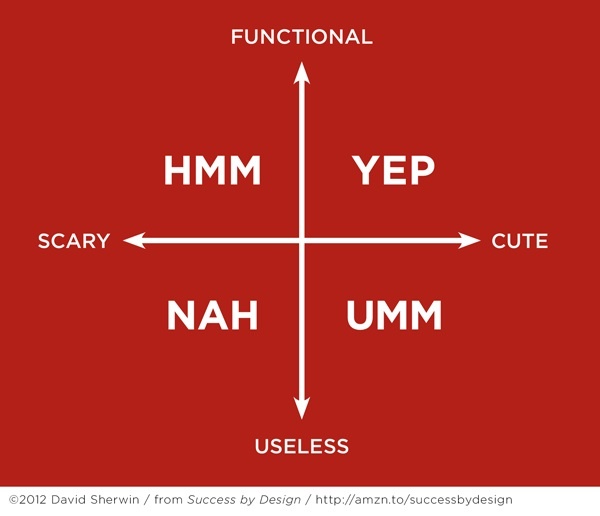 The design strategist may not be an expert in all of these domains. Instead she may serve as a sort of general contractor to connect design teams with the appropriate partners throughout the implementation process. At this point, a design strategist’s careful planning gives way to a deep understanding of what tactics will fulfill intended strategies. 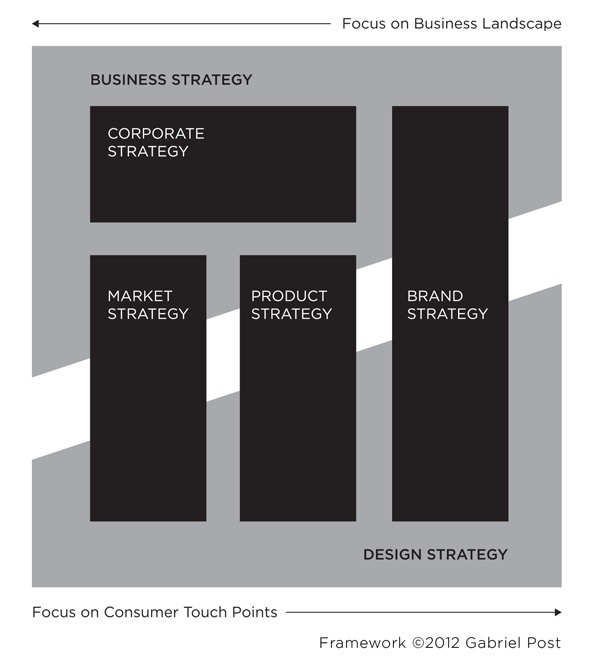 How does design strategy align with your client’s business aims? Now that you have a sense of what design strategists provide for their clients, you can begin to explore the roles that designers can play in helping to formulate and realize strategies on behalf of their clients. Designers may influence strategies within the following areas of a client’s business operations. Corporate strategy: Corporate strategy governs how a company intends to sustain its operations over time. Corporate strategy seeks to answer one question: What business are we in? The corporate strategy is manifested through the mission, values, goals and aspirations that a company has set for itself. You’ll also find it in the client’s plans for partnering with favorable firms, merging with competitive firms or acquiring companies or IP to support its interests. “This area has traditionally been the domain of management consultants, but designers bring a clarity of thought and the power to reduce complicated strategies to digestible images, frameworks and stories, which makes them good candidates to play here,” says Timothy Morey. Business strategy: Business strategy is a broad umbrella that encompasses the most important ongoing considerations for any corporation, from process optimization to product/service portfolio management to operations, finance and marketing. However, it can almost always be summed up as an attempt to answer this question: How are we going to make money within our market? Business strategies support corporate needs: Meeting revenue targets, achieving desired market positions, rewarding shareholders, fulfilling stated corporate strategies and more. Many services that design businesses provide, such as product/service strategy, brand strategy and marketing strategy are flavors of business strategy and may be generated by a design strategist who has the appropriate expertise. Brand strategy: Brand strategy is the practice of formulating how a company’s brand—the sum of how the company is perceived through all of its interactions with its customers—is manifested through corporate marketing, communications, product and service design, interactive design and business operations. Designers who work on a company’s brand translate corporate strategies and business strategies into a brand position, which may then touch a company’s product/service strategy and marketing strategy. Product/service strategy: Product and service strategies help to define and shape the evolution of a company’s portfolio of salable products and services. I use the word portfolio very deliberately, as a corporation’s business strategies are realized through proper investment in their best-performing products and services. While product strategy is often depicted as an outcome of corporate and business strategy, in reality it is often the driver of those “higher order” strategies. A designer with a great product strategy can end up surreptitiously changing the business or corporate strategy of an organization. Think of Apple’s initial foray into the music business with the iPod, or Amazon’s impact on the publishing industry with their Kindle products. Marketing strategy: Marketers explore a client’s business strategy and product/service strategy, then determine what actions should be taken in the market to better sell a company’s products and services to reach stated business goals. Designers who play in this space may influence product/service strategy and business strategy. Strategy as a service that designers provide: A designer may provide even more flavors of strategy that impact a client’s business: interactive strategy, content strategy or media strategy, just to name a few. Many of these strategies are closely tied to what should be realized, and how, but they may not be offered by a business strategist. While it’s tempting to elaborate these strategy types in depth, I think it’s more important to note that these are services that support the delivery of design strategy. Design strategists must be able to string tactics together into a plan that every person at the table can agree upon and execute with confidence. Much of what we design can create new patterns in behavior and can cause business strategies to form in an emergent fashion. But we can’t create a media strategy and claim to be a corporate strategist. Nor can we completely revise a company’s business strategy when formulating a content strategy. What a design strategist can do is help clients visualize how they can reach a set of agreed-upon objectives, with the appropriate tools and resources at their disposal. How do I help set strategic direction for a client project? BFAs advising MBAs regarding their business strategy may seem a bit strange to both parties involved, but as you’ve read so far, designers can have great influence on how a company’s business strategy is realized in the market. To act as a strategic partner for any organization means reaching a place where both of you agree on the problem you are trying to solve—while remaining flexible enough to accept that this agreement will likely change as the project progresses, due to market forces. But the most critical part of solving business problems through design requires investing in learning about a client’s business and its competitive space. We often forget to approach our client’s problems with the same level of rigor that we would approach the formal design process. Over time, this is how a designer becomes a strategic partner for her client. This process often begins with asking the right questions during the proposal stage or while writing a brief. The secret sauce in these long-term sustained conversations is to think about problems as a space that both people and companies maneuver through over time. Designers can help companies define where they stand within that space—as opposed to grasping at problems to solve—and help business stakeholders find a consistent language to describe the challenges they face and how they interrelate, from organizational units and market segments to long-term goals and brand style guides. Do not underestimate the power of design and storytelling to rally organizations behind a well-articulated strategy. Given that designers are typically highly visual people, or at least model makers, I highly encourage strategists to co-develop visual models… with the designers of the products that will live in it. Some common models used are ecosystem models, value-chain models and “marketecture” models… each has a slightly different take on what is described in its “landscape”. The better the understanding of the world which a product is being designed for, the more meaningful the resulting product. And since I’d argue the value of design is in the degree to which the result is meaningful for the end user, being part strategist is becoming an essential part of being a designer. And lastly: As a strategist, it’s not your job to just say yes. It is often said that strategy is as much about deciding what not to do, as it is about selecting what to do. Having a high-level, strategic impact on any company requires a deep level of commitment, trust and a sustained relationship over time. None of these emerge instantly on day one of your very first project. And none of them come from being a yes-man. You need to choose to ask the hard questions early on, in a way that can be heard and responded to, and every compromise you make should be clear-eyed and shared. And if you don’t? You may obtain a well-paid client engagement, but you won’t be invited back to the table as a strategist. This is a cross-post from frog. David Sherwin is a principal designer at frog. He has built his reputation as a seasoned user experience professional, design researcher, and art director, with 14 years of experience in generating compelling solutions for systemic business problems. David is the author of Creative Workshop: 80 Challenges to Sharpen Your Design Skills and the forthcoming book Success by Design: The Essential Business Reference for Designers. You can follow David on Twitter @changeorder.